Jaguar is a beautiful rainforest animal. Like the lion of Africa, tiger of Asia and leopard of south-east Asia, jaguar is the "Big Cat" of the Americas. 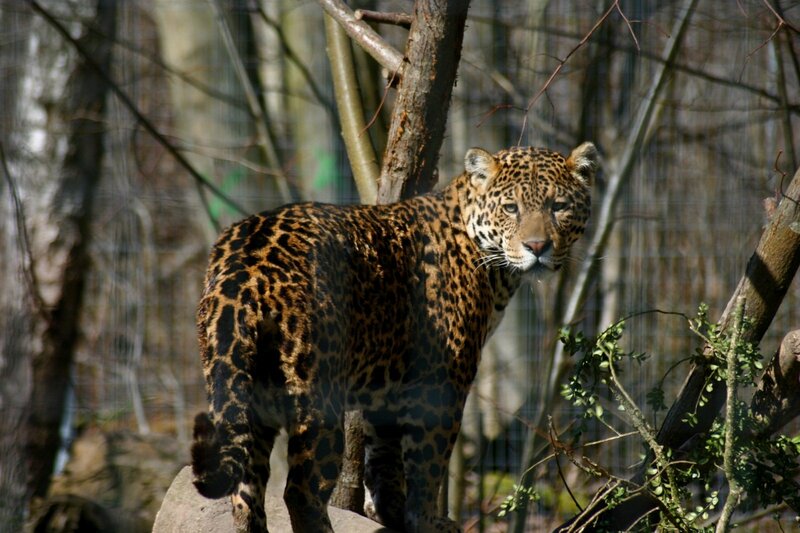 It resembles leopard, but mainly due to the skin pattern - in fact it is larger and stockier than leopard, has shorter limbs, and at close examination even their pattern is different, with this of jaguar's being larger and darker. Rare albino and melanistic individuals exist, these are sometimes commonly called white resp. black panther. It is a large animal, weighing up to 100kg, and it is known for its strong bite that can even break turtle shells and mammal skulls. It is a solitary, mostly nocturnal hunter, and an opportunistic predator. Its diet consists of meat only, and it is an important key species in its ecosystem where it controls the numbers of its prey species. It attacks humans much more rarely than other "Big Cats" do, and much more rarely than humans kill jaguars. This happens mainly because of fur trade and conficts with farmers, because jaguars don't mind eating cattle. Jaguars are however protected. They are on decline because of getting killed by humans as well as habitat destruction. Their most prefered habitat is rainforest, but as that is getting destroyed, they also inhabit open grasslands and other open, drier ecosystems. They do need water though, and as not so common amongst cats, they enjoy swimming and are good swimmers. It is found between the southernmost United States in north and northern Argentina in south, with the exception of Uruguay and El Salvador where the animal has gone instinct.